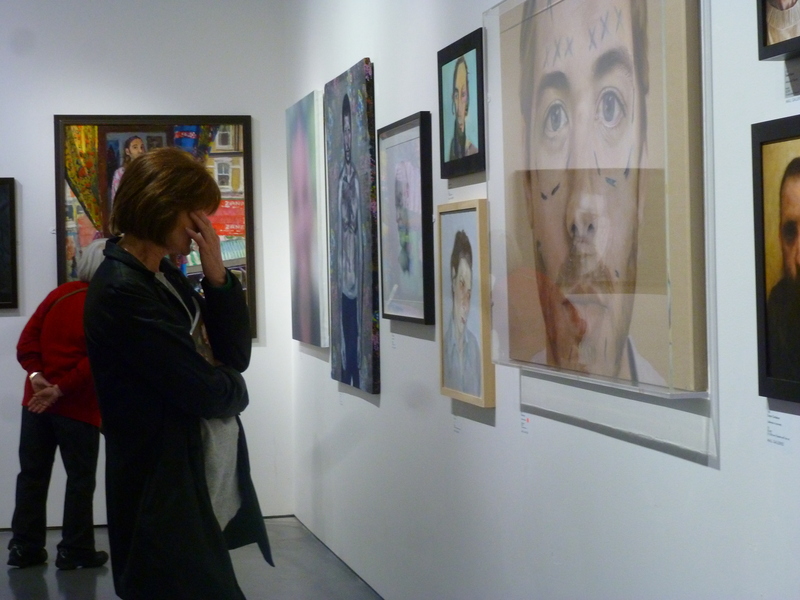 The Mall Galleries – Portraits, portraits and even more portraits! Prior to leaving the house, I found out from the National Gallery’s Twitter feed that they were launching the Titian Experience with the Art Fund that afternoon. I decided I would make a small detour to check it out. Alas, when I arrived I had already missed the last public viewing. 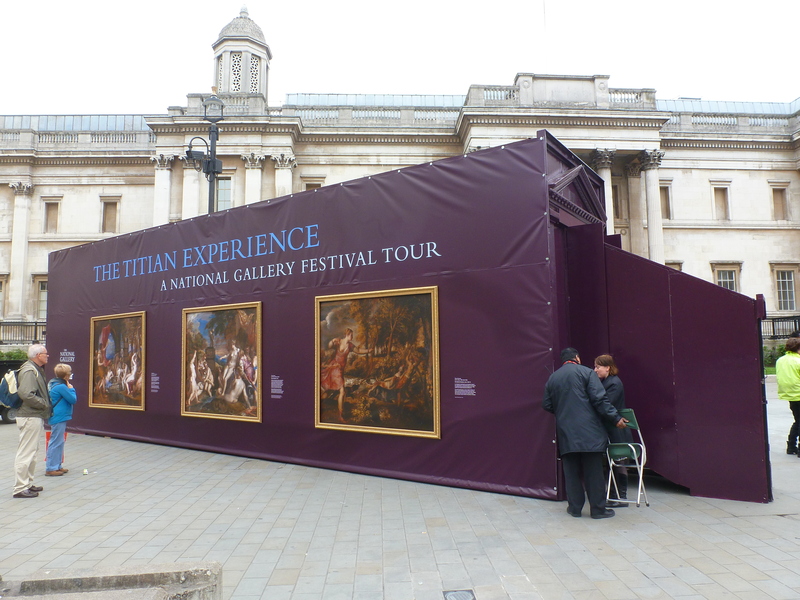 The Titian Experience is a touring mobile cinema that is supposed to offer a National Gallery Festival experience, celebrating the recent acquisition of Titian’s Diana and Callisto (1556-9) from the National Galleries of Scotland. Last year, the National Gallery held a free celebratory exhibition of the three Metamorphoses paintings, entitled Metamorphosis: Titian 2012, for the Cultural Olympiad to commemorate this acquisition. Alongside it was the collaborative ballet of the same name, performed at the Royal Opera House – I was lucky enough to see the performance, and it was truly astounding! On the outside of the cinema are three full-scale reproductions of Titian’s paintings – Diana and Actaeon (1556-9); Diana and Callisto (1556-9); The Death of Actaeon (c. 1559-75) – complete with gilded frames. From a distance, you could easily perceive them as the real paintings themselves, currently hanging in Room 9 and 10 of the National Gallery. Visitors can step inside to watch a short film ‘that approaches Titian’s work from a 21st-century perspective.’ A National Gallery expert will also be introducing the film and viewers will have the opportunity to ask questions. Despite failing to see the screening, I did manage to ask for one of the star-shaped pin badges they were giving out to viewers. Once the detour was over, I headed to the Mall Galleries nearby. Originally I was going to see the SELF showcase there, but when I arrived I was presented with a bit more than I expected. Turns out the Mall Galleries was a space dedicated entirely to exhibitions, SELF occupying only one of its rooms. It wasn’t until I was halfway through exploring what I assumed to be the permanent collection that I realised I had entered another exhibition. I like columns. Do you like columns? Own photograph. 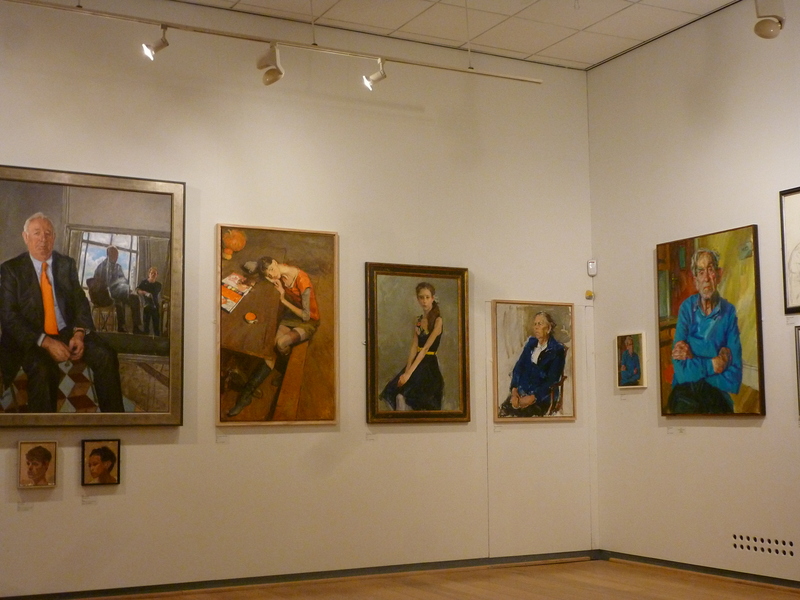 The Royal Society of Portrait Painters Annual Exhibition 2013 is…well…an annual exhibition, showcasing the recent portraiture of various artists. 192 works are exhibited across the 5 rooms of the gallery space, including one wall of the Threadneedle Space, where SELF is being shown. The exhibition presents a diverse range of styles and sitters, from well-known celebrities such as Oscar Pistorius to the artist’s own daughter. According to the catalogue, 84 entries were selected from a total of around 1,400. There is no particular theme, other than being in the category of portraiture. The mediums range from graphite and pencil drawings to watercolour or oil paintings. The sitters are depicted with varying expressions, from Peter Brown’s irritated, possibly angry, little girl in Ella against the studio wall, to joyous family compositions in Leonard McComb’s Portrait of Nick and Tika Nabarro and Winnie – Winnie is the family dog. But just when you thought you knew all about portraiture, Andrew Festing presents us with two panoramic paintings of the Tamporley Hunt Club, a highly energetic work where dashes of green and red animate the actions of each club member around what appears to be a feast or meeting, exhibited in the North Gallery. I particularly liked Annunziata and me by Anthony Connolly, a beautiful composition of the elderly artist embracing his young daughter, while in the act of painting some flowers. 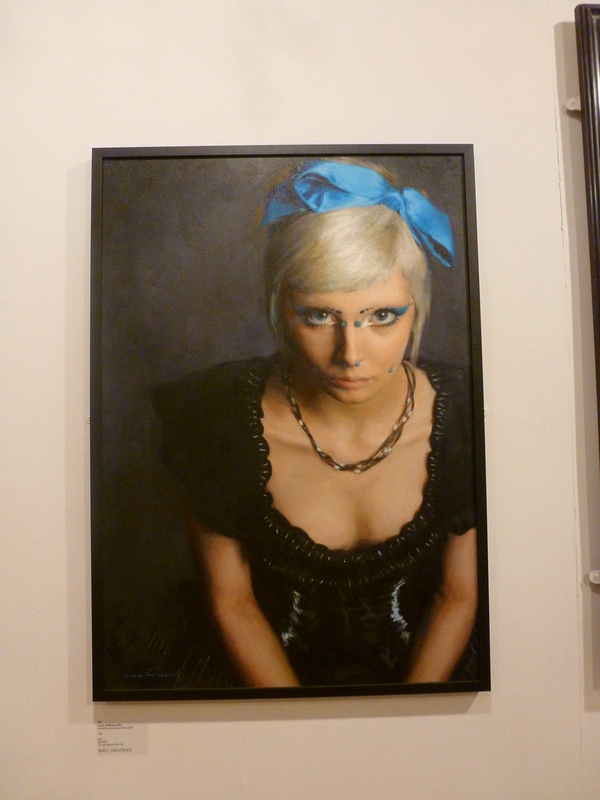 Some were composed like photoshoots, such as Iska by Luca Indraccolo, depicting a beautiful adolescent girl in dark clothing, in front of a dark background, sweetly contrasted by a bright blue bow worn on her head. The intensity of her gaze reminds the viewer of both her innocence as a little girl and the maturity of her future self. Valeriy Gridnev’s Natasha and Diana present us with two honest portraits of two lovely girls, the former as if it was a snapshot of a beautiful moment, while the latter sits elegantly on a stool, dressed in a navy summer dress, waiting to be rendered in a way that is comparable to her beautiful self. Luca Indraccolo, Iska. Own photograph. 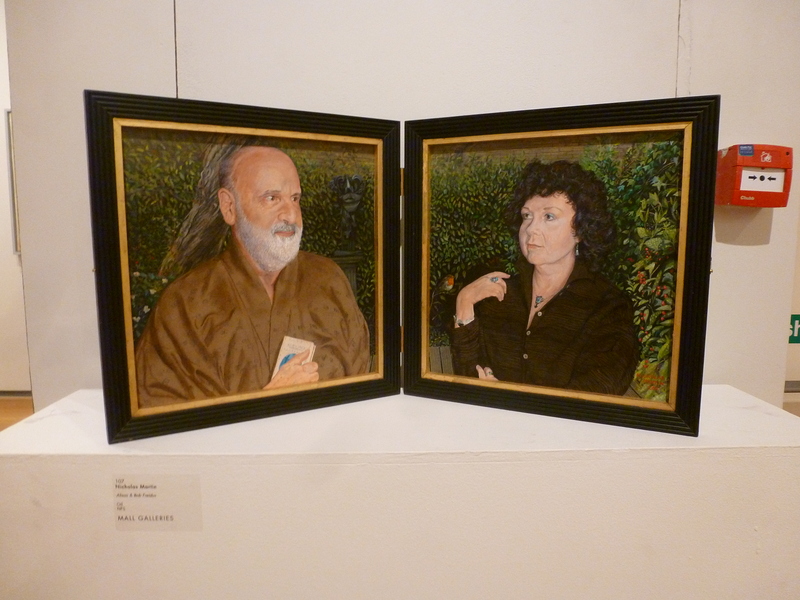 There was a diptych by Nicholas Martin entitled Alison & Bob Freidus in the corner of the Main Gallery, while Daphne Todd’s triple portrait Ian Beesley Esq. makes us also think about the materiality of the painting – the surface was constructed from three wooden segments that fit together to form a rectangle with varying gradients. Hanging close by is a lovely portrait of Her Majesty the Queen…except she looks rather…inanimate. Dieu et mon droit – a motto referring to the divine right of the Monarch to govern – by David Cobley presents the seated monarch as if she was set in gold, blending into her extravagantly-decorated golden surroundings, but with a face that shivers with ice-cold blue. Nicholas Martin, Alison & Bob Freidus. Own photograph. Several prize winning entries were exhibited too. The winner for the £10,000 Ondaatje Prize for Portraiture was Mark Roscoe, whose rather disquieting, and quite scary, Olivia Roberts shows us the image of a young artist who seems to have a passion for horses. Meanwhile, on a wall of the Threadneedle Space, Sheila A. Street won the Art Academy Drawing Prize with My 95 year old dad, while Toby Wiggins’ highly photorealist pencil drawing Mary Spencer Watson, Sculptor won the £2,000 Prince of Wales’s Award for Portrait Drawing. Shown nearby was Melvin by the £3,000 de Laszlo Foundation Award winner Kelvin Okaforr, a graphite drawing that could easily pass for a straight photograph. The imitation of flash-usage highlights the tiny speckles on the subject’s face. Even the distortion created by the lens is accurately rendered. On the remaining three walls of this space, are the 29 shortlisted works from SELF, a new major £20,000 art competition launched by the Society last September. Around 950 submissions, all of them self-portraits, were presented to judges Charlotte Mullins and Phil Hale. The shortlisted works present us with images that push the boundaries of self-portraiture, images that transcend from their material depictions to engage psychologically with the viewers. Compared to the other works in the neighbouring exhibition, these self-portraits are much more intense in their portrayal of the artist. Sarah K. Meredith’s Self-portrait, 63 portrays a modest image of herself – a toiled, hardworking artist with a hint of sorrow in her weary eyes – while Love the skin you’re in by Oliver Jones shows a portrait where the artist stares at the viewer, while his face is marked with lines and crosses, evoking the procedures in plastic surgery. There was a decent variety of painterly styles some of which could be traced back to Gothic representations of Pagan saints, appropriated by John Sims in his In a chalcolithic dream. Roberto and Renato Miaz’s Remake thee! cleverly blurs an image using acrylic paint, but it could still be distinguished that the sitter is a joyous male. Both exhibitions are very well curated and hung in a way that is uncluttered, despite the large numbers of works in a four-room gallery space. They present us with a lot of very high quality portraits in a diverse range of styles and mediums. 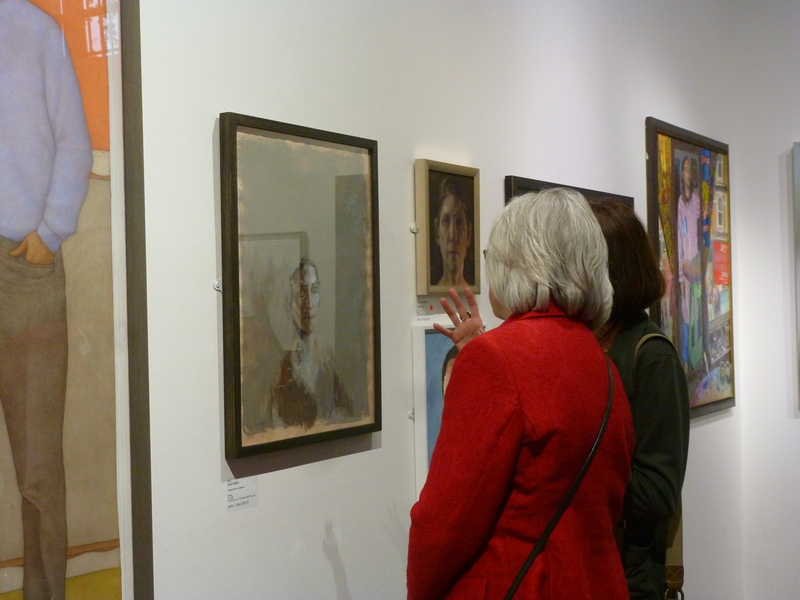 Better yet, the Mall Galleries actually offers visitors the opportunity to commission portraits from the artists themselves. Now wouldn’t that be a lovely Christmas present? Titian Experience runs until 21st July 2013 at various UK venues, www.nationalgallery.org.uk/titian-experience. 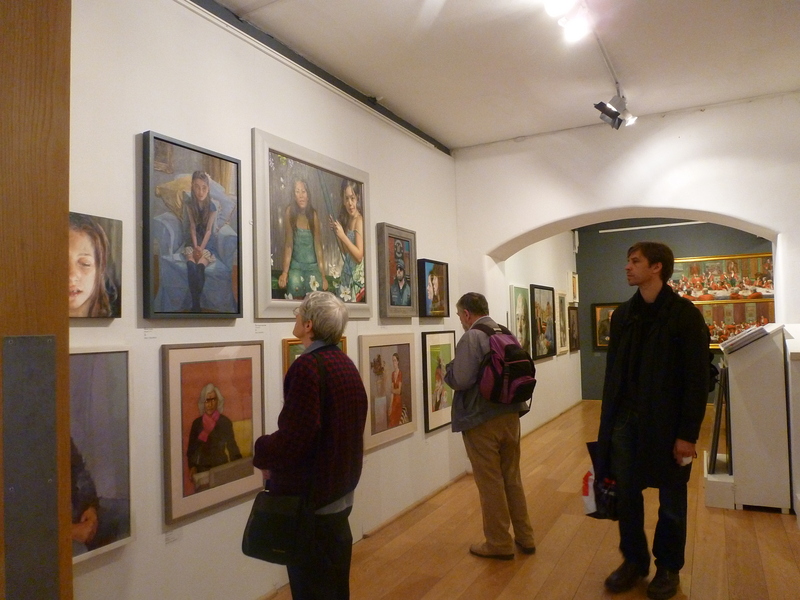 Royal Society of Portrait Painters Annual Exhibition 2013 runs until 24th May 2013 at the Mall Galleries, London, www.mallgalleries.org.uk. 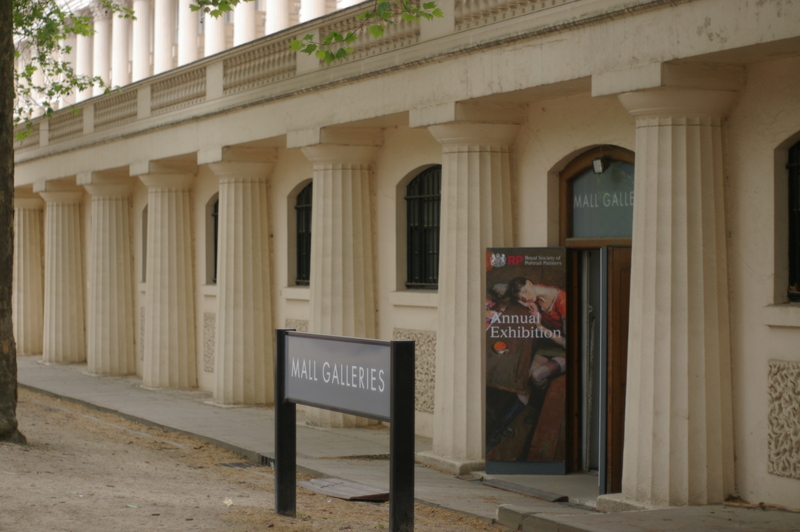 SELF runs until 24th May 2013 at the Mall Galleries, London, www.mallgalleries.org.uk. Next Post Two-Faced Fame – celebrity or commodity?